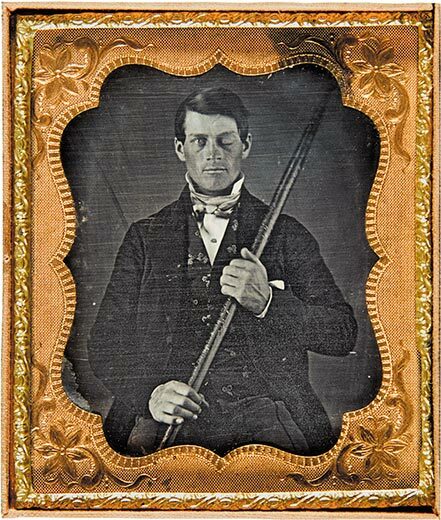 According to the Smithsonian Institution magazine, and contrary to Rhod Gilbert's recollection, the tamping rod did not remain lodged in Gage's skull. His personality change, however, is supported by contemporaneous accounts. A photo of Gage was found about 30 years ago, but not identified as being of him until 20 years later. I didn't think Rhod's account was correct, but I hadn't got round to checking it. You saved me the bother. For a man who had an iron rod blown through his head, he looks a fairly presentable chap. The scar is visible under his fringe and he's holding the tamping rod. 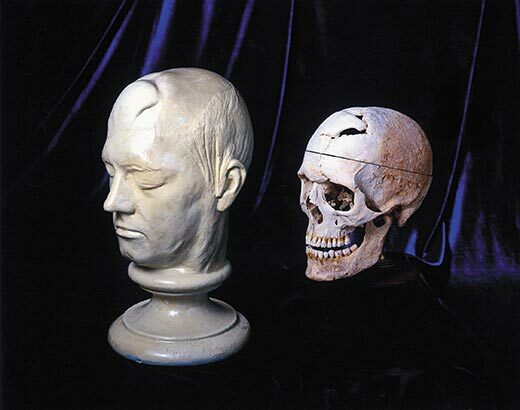 Mask of Gage's face beside his skull. Now I look, I can indeed see the scar, but compared to others who have suffered similar injuries, he looks quite well.